Commentators have been reacting to the news that President Putin is backing Dmitry Medvedev as his successor. Andrey Kortunov, President of the New Eurasia Foundation says Medvedev was a surprise choice. “Right now many people will argue they predicted this nomination many weeks and even many months ago. I still believe it was a surprise to many of us,” Kortunov said. “It's interesting that this particular candidate is supported by a coalition of parties – not just pro-presidential ones like United Russia and fair Russia, but by the Agrarian Party which is traditionally more associated with the opposition. This is very indicative that Medvedev can at least for the time being count on rather broad support from various political forces in the country,” he added. Dmitry Suslov from the Center for Foreign and Defence Policies said that if Dmitry Medvedev becomes President, Russia can expect further development of its relations with the West. “Medvedev is not a hawk. He is considered to be a moderate liberal in terms of Russia’s economic and political development and Russia’s relations with the West…the EU first and foremost. So there will not be any kind of fall in Russian-Western relations but rather the current tendencies of Russian foreign policy will continue,” Suslov said. Duma Deputy Aleksandr Lebedev said Mevedev was a good choice. He said the First Deputy PM had “a good track record” as well as a good education and plenty of experience. Putin's support, he said, was only one factor making Medvedev the front-runner. “The four parties support, which combine like 74-75% of the vote at the election, plus the mass-media support, which amounts to 15-20% extra. That puts Medvedev into a very good position to win the election,” Lebedev said. Political analyst Aleksey Makarkin says Medvedev is already a well-promoted candidate. “Medvedev has been considered as the main successor since 2005 when he was appointed as First Deputy Prime Minister and became in charge of national projects. What are the national projects? National projects mean recognition. They mean that the successor will not need any additional advertising,” the expert said. “Medvedev became a man whose name is linked with the growth of the salaries of doctors and teachers. He presided over the improvement in the agriculture sector and social services. All this is of primary importance to people, so Medvedev is a well-promoted candidate in this sense,” added Makarkin. Vyacheslav Nikonov, the president of the 'Politika' fund said Dmitry Medvedev's nomination does not come as a surprise for most analysts. “Putin once said there were at least five potential candidates for his position, which means he was thinking about at least five potential successors. I believe Viktor Zubkov, Russia’s incumbent Prime Minister, was once on top of the list. And so, why Putin chose Medvedev? Of course, only Putin knows the answer. But it’s worth mentioning that Medvedev has been close to Putin for many years. He has probably more potential and a longer time span to be an important political figure in the country,” Nikonov stressed. The Director of Carnegie Endowment Rose Gottemoeller has told that once the U.S. and Russian presidential elections are over, the two countries can head back into a positive relationship. “We are clearly in the midst of an election campaign here in Russia at the moment and also an election campaign in the U.S. We are in the midst of the very uncertain political season in both countries. And for that reason there have been some tensions and anxiety between the U.S. and Russia recently,” said she. 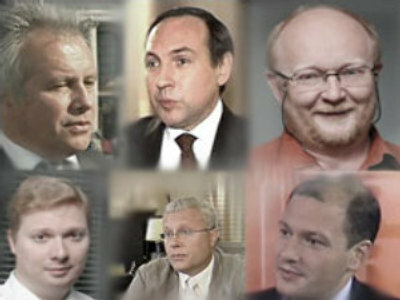 “If Dmitry Medvedev becomes the president I hope that will be the case,” believes the expert. “If it's Putin's only recommendation than it's a good one because we would prefer to see a business man like Medvedev rather than former KGB person, such like Ivanov. Times like most of the West thinks it would be better to have Medvwedev as president but it may not be Putin's last word. He may also suggest that Ivanov should run for president. If he does that then we are back to the original guessing game,” noted Michael Binyon, the Times leading writer. “He is completely subordinate to Putin who will keep his position as political and national leader. As for Medvedev himself, I don't believe he is able or allowed to take important measures in domestic and foreign politics. He will continue Putin's line without any change,” Malashenko believed. According to Aleksey Arbatov, a Member of the Russian Academy of Sciences, the nomination was a carefully stage managed political move. “This person was chosen by other people and groups. It was not done by the four parties. They were asked to come and formally propose this candidacy to Putin and make it a nice political gesture. What is certain is that Medvedev was chosen in the Kremlin after long bargaining, a long process of selection between Putin and various clans and pressure groups,” Arbatov said. Sergey Brilev, a member of Russia's Foreign and Defence Policy Council and TV-presenter says the nomination of Medvedev for the presidency poses two major questions for the future of Russian politics. “Under the Russian system the president enjoys far-reaching powers, including the appointment of the regional governments and members of the federal government. I’m wondering whether the government appointees, who’d been appointed by President Putin, will be approved by the new president. Have they been approved by Vladimir Putin or the Russian President – that is the first question. The other question is about the future of the United Russia party. Will this party be able to re-invent itself when changes occur?” Brilev asked.